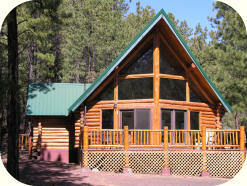 Rent a real log cabin in Greer Arizona! 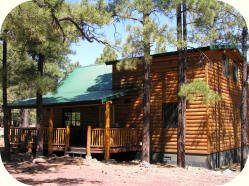 Enjoy your vacation with terrific views on 34 private acres bordering National Forest Land in beautiful Greer, Arizona! The Beartooth, the Shoshone, the Teton or the Lamar, our four superb log cabins provide you with everything you'll need to enjoy your mountain escape. 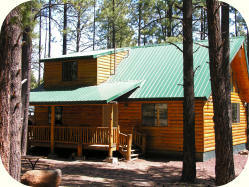 Pristine ponderosa pine forests, cool, fresh mountain air and only a short walk to the fabulous Greer Lakes known for their trophy trout. Fully equipped kitchens. You'll have plenty of time to enjoy the great outdoors! Free WiFi in every cabin. Gas Fireplaces, comfortable furnishings and gorgeous views offer you a truly unique and pleasurable experience. You'll find fine dining in Greer or nearby Springerville and Eagar. Horseback riding, museums, shopping and more are only minutes away! National Forest Trail heads are only ¼ mile away. For the adventurous ... Petrified Forest National Park and the Painted Desert make a delightful day trip! If you ski you're only 15 minutes from Sunrise Park Resort and some of the finest downhill skiing and snow sports available in the Southwest. Plus, if you enjoy watching wildlife you'll find elk, deer and a variety of wild birds often visible right from our cabins! Amenities include: gas BBQ's, outdoor firepits and horseshoes. Play volleyball? We now offer a volley ball net on our property. Bring your own ball! Pets are also allowed subject to approval. $20 per pet/night. If you desire to bring your Quad, you'll find a variety of trails nearby for your enjoyment. Sorry, we do not offer you to opportunity to ride your Quad on our property. Do you own a horse and enjoy riding in the Forest? We offer you the opportunity to reserve our cabins and bring your horses with you! Please note however, that we do not offer corrals or barns. Securing your animals and cleanup is your responsibility. 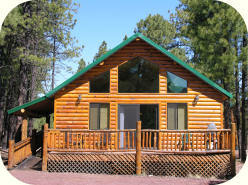 Myrick's Cabins are RV accessible with sewer and power available when you rent our Beartooth Cabin. Hook-up fees are applicable. We invite you to inquire. Smoking: All cabins are smoke-free. Ash trays are provided outside (subject to fire restrictions). Bring your family back to Nature's Treasure! Call today for your reservation or use our convenient request form to inquire about availability!